Forget the year of the quarterback. This is the year of the pass rusher. OK, guys, I’m now officially as sick of Andrew Luck as I am of Tim Tebow. That was fast! I’d rather muse about the big uglies up front. Based on last weekend’s action, Luke, I posit that it is offensive linemen that need to be evaluated differently. More likely, the correction to the all-out carpet bombing that defined the first half of the NFL season is upon us, thanks to an uptick in the ferocity of pass rushers. For every elite pass protector I can name off the top of my head (Donald Penn, Jason Peters, D’Brickashaw Ferguson), there are five pass rushers who put the fear of God into opposing quarterbacks. (And speaking of the need to evaluate linemen differently, both Penn and Peters were undrafted.) Seemingly seconds ago, Rex Ryan-style big blitzes were in vogue, but offenses based on hot reads and quick decisions have made them too easy to defeat. Defenses have responded by putting the emphasis on getting heat with three to five down linemen and mixing coverages behind them. Last weekend, they won that battle. There were 91 sacks in the 13 games played in front of fans wearing Halloween costumes, an average of seven per game. In the 103 games played in the first seven weeks, there was an average of 4.5 sacks per game. Nevertheless, the overall sacks-per-team average is up from 2010, and Jared Allen and DeMarcus Ware (who have 12.5 and 12 sacks respectively) are both on pace to surpass Michael Strahan’s single-season sack record of 22.5. This is all small-sample-size theater, of course, but my main thought while watching games this Sunday was “can’t anyone here block anymore”? Ware, Chris Long, and Jason Babin, among others, ran wild in enemy backfields, and of course the Lions held several team meetings on top of Tebow. The 2011 draft has been seen, then and now, as being all about the quarterbacks. In reality, the dudes seeking to do harm to quarterbacks were the story. I count 10 players selected in the first round whose main job qualification is their ability to rush the passer, and those guys are already having a huge impact. San Francisco’s Aldon Smith has 6.5 sacks, and Denver’s Von Miller has six. 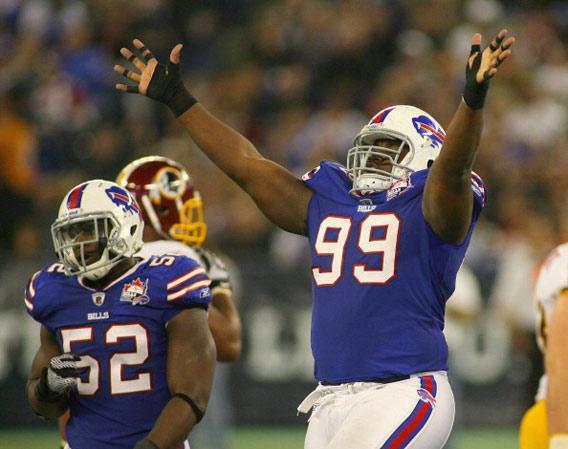 Marcell Dareus of Buffalo demolished Washington’s blocking on Sunday, finishing with 2.5 sacks of his own. If you’re looking for a reason for the Bills’ surprise spot atop the AFC East, forget the egghead QB and look to the monster in the middle. Monday night, Tamba Hali of the Chiefs turned San Diego’s tackles, especially Marcus McNeill, into guava jelly. Hali had two sacks, countless pressures, and forced McNeill into a holding penalty, one call for illegal use of hands, and four false starts. McNeill, mind you, is not some third-stringer. He’s among the league’s better tackles, and got a contract extension this time last year that guarantees him $24.5 million. If this is a state-of-the-art pass protector, then I’m worried for the fate of NFL quarterbacks. There was one other notable thing about Monday’s game: the horrid, inconsistent officiating. After watching the Chiefs and the Chargers, I am no longer certain what constitutes a legal tackle, pass interference (offensive in particular), roughing the passer, and a completed catch on the field as compared to a completed catch in the end zone—all seem to vary week by week and game by game. It wasn’t just Monday night. In the Cincinnati-Seattle game, Tony Corrente and crew missed blatant holding calls, helmet-to-helmet hits, at least one clear-cut punch, and didn’t whistle the Bengals for deliberately sitting on Marshawn Lynch as the first-half clock expired. I’ll give Corrente a bit of a pass, though, because his squad had to officiate the Bucs-Bears game in London the week before. Tampa and Chicago were granted a bye week in the aftermath of traveling to England, but Corrente—who’s also employed as the coordinator of football officials for the Pac-12 Conference—was not. Between the jet lag and the bangers and mash, it’s not surprising that Corrente and co. couldn’t control a very chippy game in the Pacific Northwest. NFL refs don’t work every weekend; bye weeks mean fewer games, which means fewer crews needed. Why Corrente’s crew wasn’t given a bye week of its own after the London trip is mystifying. More to the point, perhaps it’s time to add more time off during the season for these guys. For all the grief I’m giving the refs, I recognize that calling an NFL game is a near impossible task. If we lighten their load, maybe the job would get just a little easier.